Tete a Pied’s September outfit really shows off the texturing they’re known for. The creases on the prim sleeves are soft and the skirt is wavy. The skirt can be worn with other tops. The skins are all amazing. Even the one I didn’t think I wanted at first sight turned out to be a must have when demoed. The jewelry is Miriel’s new star set, another in her everyday line. And the shoes. Lassitude & Ennui’s new flats. Don’t they look amazing? Sculpty shoes can have a problem fitting close to the foot but these look great. Yet another Relay for Life set from First Impressions. I’m beginning to wonder if Pukk Abel has a story of her own about cancer. Anyway, I’m wearing the Awareness Ribbon shirt in Periwinkle (Pancreatic Cancer) with the LuLu cuffed capris in Indigo from Celestial Cities and the freebie signature sandals from Lassitude and Ennui. I love the rucheing on the top, it’s a nice classic touch. Next is Rivoli by Last Call. It’s semi-professional, it has a corset, I’m one of Pavlov (Ginny)’s dogs. You’ll notice I’m not wearing the adorable prim lace puffs. Just not me. The flowers aren’t really either but I couldn’t resist. They’re a freebie from Drifting Sands, fabulous jewelry also available. This amazing pearl set I found at the clothing fair of all places. The fair is over but hopefully they’ll be at Raven’s Creations & the upcoming jewelry fair. It honestly looks more like Tanya than me but I found them first *mwahahaha*. I had to do it. When I first saw Rivoli. I wondered where the pants were. The top just looks perfect with them. These are cords from ETD but a pair from several of Last Call’s releases would work beautifully. Again, the top comes on the jacket layer, great for us modest girls to stick stuff underneath. I wound up with Lovelace’s Victoria Bra in pink paired with the Vamp Ketra heels in rose also from Last Call. Me likey Lyra’s shoes. I went nuts at the BOGO sale. 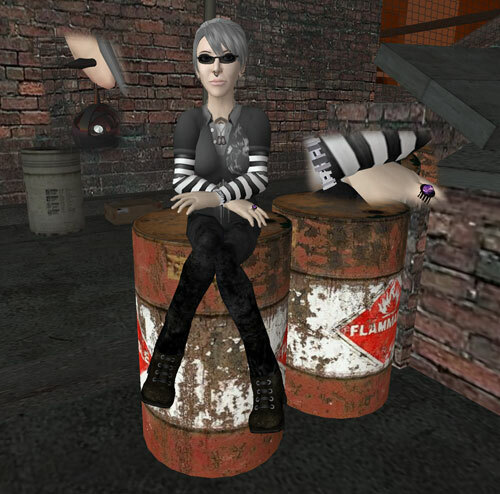 You are currently browsing the Jackal Ennui – Lassitude & Ennui category at SL Fashion Notes.